Decision: TT Suppressor F31/F51 or Fractal Define R6? (or other) for silent gaming? Discussion in 'Cases & Case Modding' started by DoubleTap, Aug 8, 2018. * Arctic Cooling Accelero Extreme III cooler on my 1080 Ti - this seems to be the noisiest component - I think I'm hearing bearing noise and I noticed tons of very tiny droplets of oil/lube on the window inside my case radiating from this cooler - I think the 3 fans on this thing threw their lube and now have a slight growl. 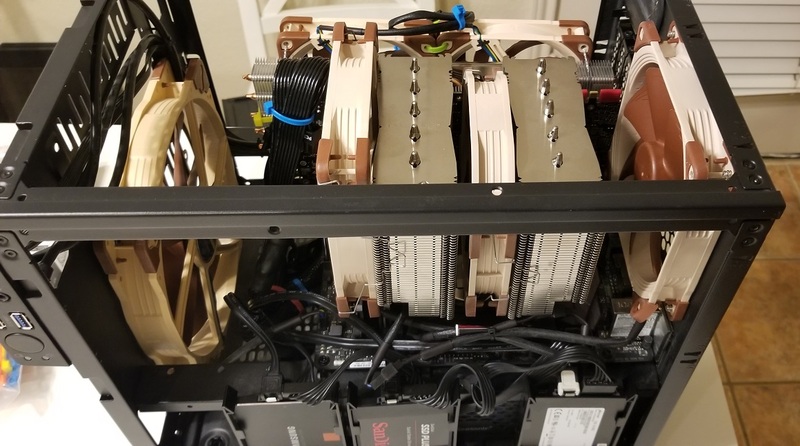 * Noctua: 200mm intake, 150mm HSF fan (DH-15s), 120mm exhaust - these fans are all very quiet and I'm using PWN fan curves to keep them as low as possible. As quiet as my PC is, my Thermaltake V21 case is very open and does nothing to reduce noise and I'm trying to cross over from very quiet to almost inaudible. I want a case that offers good airflow and as much sound reduction as possible. 1. First choice is the Thermaltake Suppressor F31 or F51 case - the problem is that I can't find the non windowed version for sale anywhere - just the tempered glass edition. 2. Second choice is the Fractal Design Define R6 - I'd prefer the gun metal version, but again, this color does not seem to be easily available with a solid panel. Can anyone who uses these cases speak to the sound dampening difference of the solid panels vs the TG panels? TG looks nice, but it seems like it's just going to resonate/transmit too much sound but maybe I'm wrong. I have the tempered glass R6. The included Fractal 140mm fans are quiet and the solid panels are sturdy, heavy gauge, and have fairly thick sound dampening applied. The PSU shroud is open at the front (where the drive bay stack would sit) and well ventilated through the top and bottom (full-length bottom filter), the fan on my Seasonic PSU rarely spins (in a room that can reach 85°F in the afternoon). The left and right panels are swappable so if you are unable to get solid panels from Fractal maybe you could trade your TG panel for a solid panel from another R6 owner. I can go home tonight and swap my TG with solid panel and see how that impacts sound - but I do not have a dB meter so it would be subjective testing. The solid panel F31 seems to be discontinued, but a 3rd party seller on Amazon has a few for $69.99 with free shipping (2 left now) so I ordered one. Not sure if I'll keep it, but I figure it's probably the best case (ha) scenario for sound suppression even if it is the ugliest. I much prefer the R6 so if you do have a chance to swap panels, I'm interested in your subjective assessment of the noise difference. I have a feeling that whatever I do, I'm going to need to replace the Arctic fans on my GPU - they're really starting to bug me. I'll try to replace them with a pair of gentle typhoons zip tied to the heatsink, but if that doesn't work, I'll probably go with the Morpheus 2 which is designed to use 120mm fans. I did some panel swapping. Having the solid panel closer to me had me perceiving the system as quieter, it also seemed to "move" system noise more to the back of the case where the fans exhaust. The biggest noise difference was closing the front panel so the system only intakes through the side vents. I also have 1 intake fan in the bottom front of the case that I usually run at low rpm, turning this on and off didn't seem to impact noise. The quietest configuration for me was solid panel facing me, front panel closed, AIO as front mounted intake, top panel closed. When the video card wasn't being taxed (Blower style Titan Xp - typical NVidia hair dryer under load) there was minimal air movement noise, mostly from the exhaust at the back of the case. As far as temps in this closed configuration 3-4°C gain under load is typical over front panel open. I have seen this result with my system and many YouTube reviews seem to match. I appreciate the effort and it does seem to support my decision to order the F31 in the original configuration. As much as I'd like something prettier, it's going to be mostly hidden behind my monitors and I really want to squelch that last bit of noise and see how close to silent I can actually get on a high performance system. If this doesn't do enough, the next step will be to relocate the CPU but my office is pretty small at 10'x10.5' and I'm sitting almost dead center as it is. CPU is currently about 3 feet away. I might be able to make that 6-7 feet but I'm not sure how much difference that will make. I sit about 1.5 feet away from my computer with it sitting on my desk. With basically no additional ambient noise in the room I can hear air movement but not fan/bearing noise. If I placed the tower under my desk I might not even hear that. From the sound of it you may need to look at building a vented and isolated enclosure to put your PC in or get even longer cords to place the PC behind blocking furniture. The V21 is a really open case so even with really quiet components, minimal fans and hard drives that almost never spin up (except for archiving) I still hear more than I'd like to. After the F31 arrives, if I still hear the Arctic fans, I'll replace those - if it's still too loud, I'll move it to the corner. If that doesn't suit me, I'll have to start looking at an all passive setup, but I don't think it will come to that. The F31 came yesterday and I moved my system over last night. The only real issue is that my 200mm Noctua fan won't fit in the front because the front panel mounting posts intrude in the space that a 200mm fan will occupy. I tried moving the fan around, but I don't see a way to make it fit without removing at least one of the front panel mounting posts which I'm not ready to do yet. 1. Use the (2) included 120mm TT fans for intake. 2. Use my (2) Gentle Typhoon 1850s for intake. Both pairs of fans are 3 pin - the TT fans didn't seem to push that much air so I went with the GT fans. We're talking about silent (or quiet really) computing, so remember that not making the noise in the first place is the most effective route. I have the R5, which I love, but it's the H115i and whatever Corsair supplied to MSI and EVGA for the 1080Ti that are doing the heavy lifting . I just need to iron out the case fans. I wonder if I put 2x 800 RPM in the front and 2x 800 RPM in the floor if that would be a good balance of noise vs airflow. Problem is, if I buy the 800 RPM fans and need more air, I'd have to replace them. You don't use fan controllers? I have 4 fan headers on my motherboard that can control 3 or 4 pin fans. My preference is to run all the fans at a constant speed. Would 5x 140mm Noctua fans at 650-800rpm be enough airflow? I'm thinking probably. I might just run static speeds on 3 fans (side panel plus 2 on the case floor) and then PWM on some faster front panel fans. Looking at Noctua and be quiet! fans - both companies do a terrible job of differentiating their different models. The Grey Noctuas are $15 but the brown ones are like $18-22 and seem to have better bearings - I think? ugh. I won't say that it makes sense, but hey. I have... three fans plugged directly in? Two on the front plus the AIO fan for the 1080Ti. The H115i has a pair of headers integrated for its two fans and provides a single-wire RPM output that hits the CPU fan header for monitoring. Most run <800RPM, but assuming stuff actually gets hot- which it really can't, barring a pump or fan failure- then they'd spin up. Mostly, yeah, you should have enough airflow for common usage. Obviously that's something you'll have to adjust on the fly if you run into issues, and one way to do that would be to get faster fans and use them with inline speed reducers (resisters) to bring them down to desirable speeds. Noctua is known for shipping those with their mainline fans and I'd bet that they could be ordered separately. I just don't like to hear the fans constantly changing speed and I'm thinking 5 slow fans might be enough airflow to keep everything cool without having to ramp up. I thought about buying the 1200 or 1500 rpm fans, but they have an Ultra Low Noise version and I can't tell if that just means "slower than other fans" or if it has better bearings or something else because if everything else is equal, I would buy the faster fans and slow them down as needed. Well, I don't mind fans ramping when needed- but I'd call it insurance . Otherwise, I agree with where you're going, and yeah, fans aren't cheap! But Noctua's are damn good. I totally underestimated them and finally got a few- mostly because I haven't bought individual fans in like six years- and I wish I'd grabbed some sooner. The 120mm I have on an H80i, which is designed for two, is dead silent when running on a 4.7GHz 7600k that's stress testing. The only intakes are two 1850 Gentle Typhoons but they just were not enough. I opened the front panel and that dropped it a few degrees, but the way the whole front is, it really chokes off the air. I ordered a pair of Noctua 140mm PWM fans (1500rpm) to see if that would help, but now I'm thinking I'm going to need the side panel fan and two bottom fans to make this work. I ended up taking off the whole front panel to let in some air. Overall I like this case, but now I'm wondering what good an insulated/dampened case is if you have to run high speed fans to get any air - vs a more open case with some slow moving fans. Installed the Noctua 140mm PWM fans in the front of the case. Then I put one of the TT 120mm fans on left panel. I'm calling this a complete failure. The F31 might be a perfectly quiet case for a water cool build, but I wouldn't recommend it for an air cooled build. The front is just too restrictive. If the fans run quiet (and they're not THAT quiet) then the CPU heats up. If the fans run fast enough to keep the CPU cool, the fans are too loud. Honestly, my wide open (but filtered) V21 was quieter and cooler than this giant black coffin. I need to sell this case and start over. Are you in an environment that requires a closed case? There is enough dust around here that I need a case with normal fan filters. The environment is my home office and my goal is to make the pc as close to silent as possible. Right, dust doesn't mix well with radiator components. It just seemed like your biggest impediment to a no-noise environment revolved around the case so I was curious if your environment allowed for the possibility of removing that variable. I wish I could say my current case is silent but we have military jets flying overhead on a regular basis which makes any subjective analysis in regard to case noise moot. I'm really frustrated with myself because I feel like I should have known better. I think my real problem is the fan bearings on my GPU cooler are worn and loud and I was trying to sidestep dealing with it by replacing the case. Moving the case to another room or something like that isn't realistic - I have 3 Displayport monitors and an HDMI monitor and the cabling would be a nightmare - plus there really isn't anywhere else for it to go. This weekend, I'll probably move it all back to the V21 case, sell the F31 locally at a modest loss and then order a Raijentek Morpheus II GPU cooler and put some Noctua Sterrox 120mm super silent fans on it. I'm kind of looking at other full tower cases that will take 2-3 140mm fans up front. The Evolv X is due out in a couple weeks, that might work really well as it should have good airflow and the case is relatively sealed. The TT V21 is not a bad case - it's just has a big foot print and is kind of plain. If at all possible, I highly recommend swapping in a GPU AIO. I don't see the value of a GPU AIO vs a large heatsink. Both have fans, but one adds a noisy point of failure. 2. The noise issue really was the stupid Arctic fans. These are stupidly expensive fans but they move a ton of air and they do it quietly. I now have a 4 slot 1080Ti, but I don't care. At idle, my system is dead silent. While gaming, it spins up, but I'd call it just a whisper. My wife just walked in as I was uploading the pics and she can't believe how quiet it is - she didn't notice the noise until it was gone. IdiotInCharge, Crackinjahcs and Algrim like this. Dammit, is there anything worse than trying to sell a PC case?